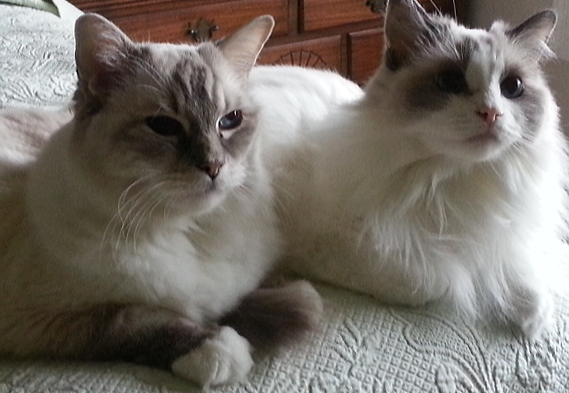 Each and every day is filled with two constants – Cagney and Sadie – our beloved Ragdoll breed cats. My husband and I are dog people (we were partial to Golden Retrievers and SharPei’s) who for the past 15 years happen to be owned by these two very-canine like felines. 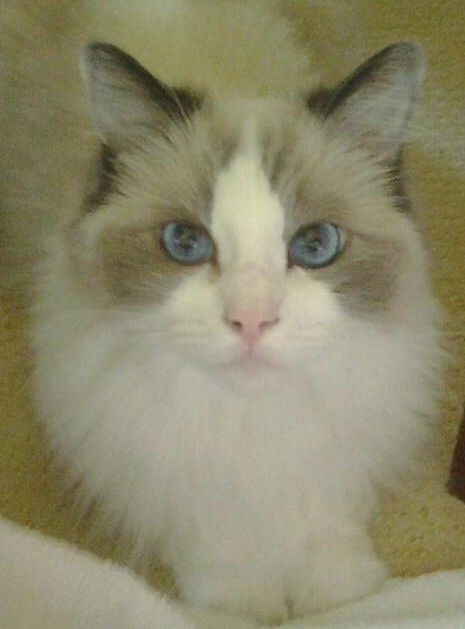 The Ragdoll is a cat breed with blue eyes and a distinct colorpoint coat. It is a large and muscular semi-longhair cat with a soft and silky coat. Developed by American breeder Ann Baker, it is best known for its docile and placid temperament and affectionate nature. The name “Ragdoll” is derived from the tendency of individuals from the original breeding stock to go limp and relaxed when picked up. Particularly popular in both the United Kingdom and the breeds’ native United States, ragdoll cats often are known as “dog-like cats” or “puppy-like cats” due to behaviors such as their tendency to follow people around, their ease at being physically handled, and their relative lack of aggression toward other pets. Cagney is fifteen years old. In human years that is about 77 years old. He is by all definitions a “senior” cat and I say, without reservation, my husband’s constant companion. Just as described, he follows my husband around from room to room and every evening jumps up onto his lap where he sleeps until it is bedtime. Cagney is a very mellow fellow. That is, until I administer his hydration therapy treatment – the feline version of dialysis. In August 2014 he was diagnosed with renal failure. As a result, every three days I administer 100 cc’s of saline solution via needle just under his skin. It is a miracle treatment that has improved his quality of life and made ours much more interesting! I spend much of my time playing “are you smarter than a 15 year old cat”. Cagney is a very astute and smart boy. He knows the signs and I swear he can tell when it is time for his treatment. Trying to outsmart him is a constant challenge. A challenge I embrace because it helps to ensure that he continues to have as healthy and happy quality of life as possible. Sadie is seven years old. 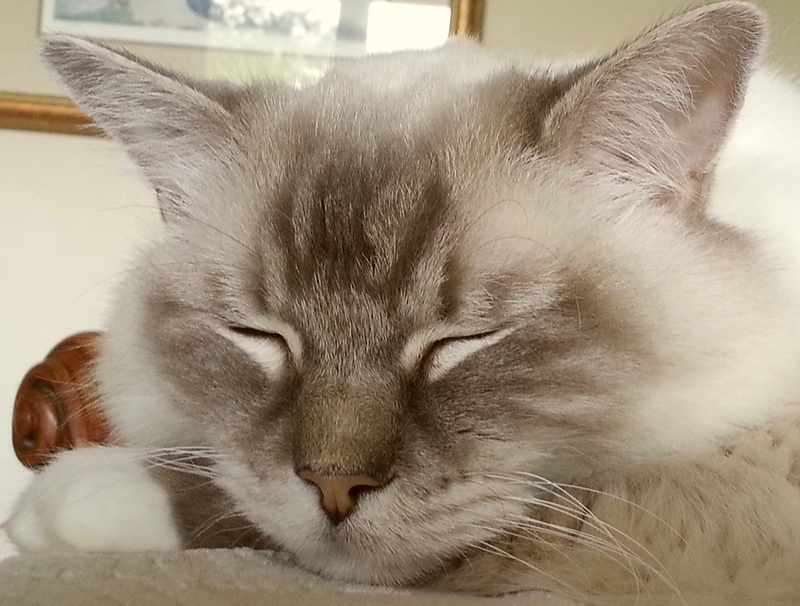 She has classic Ragdoll markings, most notably the white diamond blaze marking on her face. And those beautiful blue eyes! She is quite the talker – always with something to say about anything at all. She speaks for both herself and Cagney, especially at meal time! She loves to play fetch and has a two foot vertical jump to catch in flight her favorite objects. When we brought Cagney and Sadie home (seven years apart) I was told that I would never be alone in my home again. And it is true. Wherever I am, in whatever room I roam to, Cagney and Sadie will appear and stay with me or my husband until we move on to the next part of our home. When we awake in the morning they are at the foot of the bed. They walk us to the kitchen for that first cup of morning coffee. And since their arrival I have not had a private bathroom moment! Our most memorable moments are those times when we arrive home after a few days away (we have the best cat sitters!) and they are waiting for us, looking through the leaded-glass paned door. They seem to know that exact moment of our arrival and welcome us home in their remarkable Ragdoll way! I’ve always loved cats. Yours are beautiful! I’ve never heard of a Ragdoll cat, but they sound wonderful. And so pretty to look at. We’re former Golden Retriever people, too. My daughter had a cat that required the hydration treatments, too. No easy task! Some days are better than others. Cagney seems to have a sixth sense about when it is time for a treatment! The good news is that his most recent bloodwork shows improvement and he’s gained 3 pounds! All the hissing is worth it!